This is nice and heavy, has washed a couple of times with no issues. Bring a fun, athletic look to your child's bedroom with the soft and colorful denim and khaki sports quilt set. All your child's favorite sports are printed on a soft polyester microfiber cover in a patchwork design. The set is made of soft microfiber face cloth that is durable, perfect for year round comfort. The set is machine washable for added convenience. Love this quilt set! It's perfect for any young athlete's room, and with a great combination of colors it fits well with numerous color schemes. I purchased this quilt for my two year old son. The colors was more brighter when it arrived which was awesome. However the pillow shams was not the same as pictured, but my son loved it nonetheless. 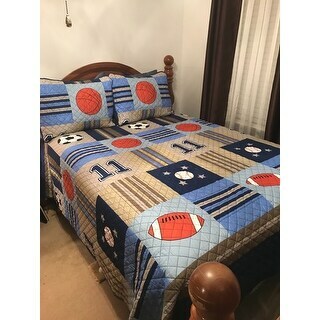 I purchased this sport quilt set for my autistic grandson whose obsession is sports. He loved it and couldn’t wait to get it on his bed. He loves everything to do with sports &amp; lives for sports.....so this was perfect for him. He now goes to bed with this sport quilt &amp; he said he could now dream with sports too! It is just liked it is pictured, it is also very functional for winter warmth. It’s for my grandsons room so it was very important that it was washable and it washes very well. There was no color fading or bunching of the quilting when washed. I would highly recommend it. It’s also nice that it is reversible for when I can turn this back into a spare bedroom. Bought two of these for my son’s bunkbeds and they are fantastic. They wash beautifully, colors are true to what is described and shown on screen, and fabric is soft and cozy. My son who is six years old is thrilled with the set! We got this for the kids' room and they loved it. It is made really well - no loose stitching or open ends. The colors were bright and the product was clean and smelled fresh. The pillow shams were not exactly like in the picture - nevertheless it matched with the quilt. My son just loved his new quilt, the colors are so bright and true to the description. The quilt is very well made but a little on the thin side. Perfect for summer we have been using an extra blanket on top at bedtime. I wish I could find curtains to match. This comforter is very light...not great for winter but I just put it on my son's bed in time for Spring and Summer. The colors are vibrant. I am not sure that the quality is worth the price we paid but my 7 year old likes it so I am happy. My son loves it! Nice quality. Shipping was not very fast. In the meantime I found an almost identical set at another store for a lower price. Comforter is not very heavy but design and color are accurate as in picture. I bought this quilt set for my son's room a year ago. It looks gorgeous! Very good quality and my son loves it. Item has nice patterns however stitching unravels even before washing ever occurs. Definitely will not purchase again. "Does the quilt have any basketballs on it? I can't tell if there is something under the fold in the picture. Thanks!" Yes, it does have basketballs. It's located near the top where the fold is in the photo. This will be perfect for my 11 year old nephew.